Visit Ouroboros for the latest Tangled Bank. It's a big one this time. There are new findings about the "hobbit" hominids of Flores island in Indonesia. The cause of their extinction was thought to be volcanic eruptions, but researchers have discovered that the ash layer which corresponds to the last "hobbit" remains was probably from an eruption several hundred miles away, and thus unlikely to have wiped out the little guys. Okay, so one possible cause of their extinction has been scratched off the list. What's the response, both from researchers and the press? "Modern humans did it!" Is there any evidence of this? No. Indeed, it would be impossible to prove any single cause of the extinction, barring the use of time travel. Twelve thousand years ago, when the last "hobbit" remains were deposited, the region was going through volcanic eruptions, changing sea levels due to the end of the ice age, and who knows what else. It strikes me that blaming Homo sapiens for the extinction of Homo floresiensis is more an exercise in secular Puritanism than it is actual science. Humans, apparently, are innately "sinful." We're presumed guilty of genocide even if it's unclear if genocide actually occurred. One sees the same attitude in other fields -- how much of environmentalism as a political movement is drawn from the same well? Yet unlike religious Puritanism, this doesn't even hold out the hope of redemption. If we're going to accuse Homo sapiens of causing the extinction of the floresiensis hominids, I want to see some proof. A body. A murder weapon. A motive. Some fingerprints or DNA. See if modern humans have an alibi. Me? 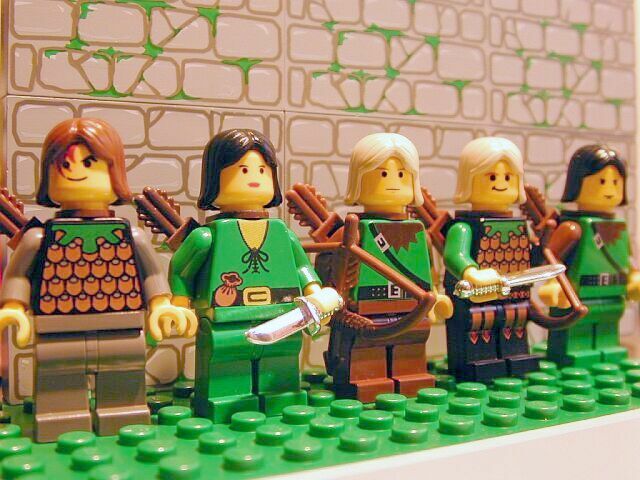 I think it was elves. The famous Fermi Paradox was first posited by Enrico Fermi while working on the atomic bomb project at Los Alamos. At dinner one evening, Fermi and others were talking about the possibility of intelligent life elsewhere in the Universe. Afterwards, walking back to their living quarters, Fermi suddenly asked "Where are they?" This is still the biggest single problem with any search for intelligent life in the Universe. Where are they? In nearly a century of searching, we have found no clear evidence of life beyond Earth, let alone signs of technological civilizations. Well, that just means there aren't any nearby, right? Maybe not. Consider the Von Neumann Machine, a concept devised by legendary polymath John Von Neumann. Build a robot which is capable of reproducing, then send it off into space with orders to make copies of itself and explore the Galaxy. Each copy makes its own copies, which make copies of their own -- pretty soon the Galaxy is packed with Von Neumann Machines. "Pretty soon" in this context is of course a long time, since at slower-than-light speeds it would take thousands of years for the Von Neumann Machines to spread through the Galaxy. Assuming the VNMs could travel at 1 percent of the speed of light, and spend as much time building replicas as they do travelling, that means it would take 20 million years for the probes to cross the Galaxy. Trouble is, while 20 million years is a long time in human terms, in cosmological terms, it's almost nothing. Less than half of 1 percent of the age of the Earth. It's entirely possible for intelligent life to have evolved that long ago -- heck, the dinosaurs might have done it if the Chixclub meteorite hadn't wiped out the troodons just as they were getting big brains. So where are they? Why haven't we seen alien Von Neumann Machines? Another depressing way to account for the great silence is to assume that civilizations are self-destructive, so that intelligent beings don't get off their home planets and never spread through the Galaxy. This had a certain vogue during the 1980s, when people like Carl Sagan tried to meld SETI research with political activism against nuclear weapons. On his PBS television series Cosmos it seemed at times that all of Sagan's lines included the portentious phrase "If we do not destroy ourselves..."
Trouble is, it's really hard to permanently wipe out a technological civilization. Even if the United States and Soviet Union had unloaded their peak Cold War arsenals on each other, places like Argentina and Mexico -- populous, industrializing nations -- would have been untouched. A concerted effort to wipe out intelligent life on a planet would require resources an order of magnitude greater than the Cold War superpowers at their most bellicose, commanded by a fanatical regime several orders of magnitude more genocidal than the Nazis. And this awful combination must occur with 100 percent success on every inhabited planet in order to account for the Fermi Paradox. It just doesn't seem plausible. The same argument applies to most of the other "social" explanations of why we haven't heard from anyone. Any explanation must apply to all alien civilizations at all periods of their history. Sure, the Denebians may be too obsessed with pro wrestling to bother with launching VNM space probes, but are the Rigelians? The Arcturans? What about the Arcturans a hundred million years ago, before they invented masked wrestlers? There is a more hopeful explanation for the great silence. Maybe we're just not looking in the right places. SETI projects still haven't done a comprehensive full-sky survey. We may be missing some civilization's radio broadcasts simply because we can't spare the observing time, or can't crack their digital encryption. We may may even be overlooking physical artifacts. While I don't believe most of the accounts of UFO enthusiasts or "ancient astronaut" crackpots, the fact remains that there's a lot of real estate in the Solar System we've scarcely glanced at. Earth, Mars, and the Near Side of the Moon have been reasonably well-surveyed. For everything else we just have a few blurry telescope images or quick space probe snapshots. And just to feed your paranoia, how do we know there aren't alien space probes on Earth right now? Forget about flying saucers or boxy Viking-style landers -- if I wanted to explore a planet like Earth I'd use swarms of insect-sized robots with maybe a few large units disguised as birds or fish. The locals wouldn't even know they were being studied. Curious how pigeons always seem to be watching you, isn't it? One of the charms of studying the history of science and technology are the dead ends and roads not taken. In science these are mostly discredited theories and obsolete paradigms: alchemy, phlogiston, the universal ether, etc. They failed the reality test and were cast aside, occasionally turning up in fantasy stories and crackpot Web sites. Technology has a bit more wiggle room. Some technologies were perfectly viable from an engineering standpoint, but either couldn't compete economically or never really had a market. The canonical example is airships. With abandoned technologies there's always the suspicion that if things had turned out differently we might actually be riding in Zeppelins or driving atomic cars. They're a staple of alternate history science fiction (if you ever want to know if you've been transported into an alternate universe, just look up -- if you see a Zeppelin cruising by, you know you're in a different timestream). Douglas Self has a magnificent Web site, the Museum of Retro Technology, with info on dozens of devices which really existed, but never became part of everyday life. Failed technologies are different from completely bogus technology. We'll never get power from a Keely Motor or burn water to power our cars. (Hydrogen, maybe; water, no.) Steam-powered airplanes don't violate basic thermodynamics, they just never could compete with more conventional designs. Something to think about while you salivate over the Iphone. Another book I grabbed on that trip to the Daedalus Books Warehouse is Animal Footprints by Yoshinko Kato. It’s a Japanese children’s science book covering a hodgepodge of fourteen mammals ranging from elephants to spiny echidnas. The text is laid out as an assortment of random facts about each species, with a focus on how the animals use their feet. It’s not too different from the treatment you find in many children’s encyclopedias, and if this were all the book had to offer it would probably get looked at once or twice and never come off the shelf again. 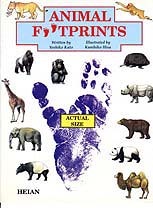 But the book also includes a life-size ink footprint from each of the animals it describes, and that’s the feature that keeps my three-year old coming back to it again and again. Today is Francis Bacon's birthday. Actually it isn't, because he was born January 22 Old Style, not Gregorian. Anyway. Bacon is one of the most influential figures in the history of science, even though he never really discovered or invented anything himself. Instead, what Bacon invented, more or less, was the modern scientific enterprise itself. Before Bacon, there was an almost impenetrable barrier between what we call science and what's now known as technology. Gentlemen did science, tradesmen did engineering. Archimedes, for instance, loathed the work he did for the Tyrant of Syracuse building weapons to defend the city -- he much preferred abstract mathematics because it was more suitable to a man of his station in life. Francis Bacon was a nobleman himself, part of the politically powerful Cecil clan which pretty much monopolized the English government under Elizabeth I. Francis himself became Attorney General and Lord Chancellor under James I, but fell from power in a bribery scandal. But Bacon's interest in science was more than that of a dilettante. As a student at Cambridge he was unimpressed by Aristotle's works, especially the great philosopher's over-reliance on theoretical reasoning rather than experiment and observation. In his own great work, Novum Organum, Bacon urged the importance of inductive reasoning from observation, rather than deduction from first principles. In other words: gather the data, then come up with the theory. Sound familiar? That's the short version of how scientists still work today. The second part of Bacon's revolutionary thought was his emphasis on applied science as a source of social benefit. In his book The New Atlantis he described an imaginary Utopia of advanced technology. He also encouraged his fellow English intellectuals to come up with ways to apply science to practical ends. All this might have been no more than well-meaning pipe dreams, but Bacon had the political and intellectual clout to make it happen. His followers became the founders of the Royal Society. It's hard for moderns to understand how revolutionary these seemingly simple ideas of Bacon's were at the time. Observe the world, and use your knowledge to change the world. But before Bacon, knowledge and intellect were part of the realm of the mind, while worldly things were the realm of the body -- and the two seldom met. Bacon built a bridge between the mental and physical realms, with amazing results for both. Researchers finally shed the straitjacket of Aristotelian pure reasoning and started actually looking at things, leading to an explosion of new discoveries. Meanwhile, scientific principles replaced the rule-of-thumb and guesswork of earlier technology, and suddenly machinery got better. Finally, his emphasis on knowledge as a public good meant that scientists and inventors publicized their work -- and so could draw on each other's discoveries. Oh, and he didn't write Shakespeare's plays. He didn't have time. But it’s really Giardia, the backpacker’s bane. It’s common, it’s global, and it’s microscopic (it’s a protist). If you drink water that contains its infective stage, chances are you’re in for several days of flatulence and diarrhea as the protist colonizes your small intestine. Ford, B. J. 2005. 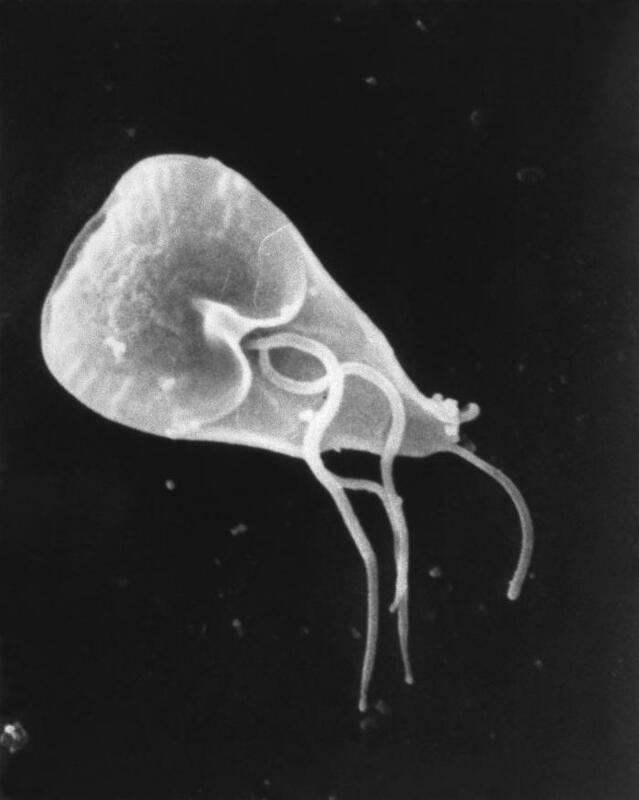 The discovery of Giardia. Microscope 53: 147-153. Tangled Bank #71 is up at The Voltage Gate. Enjoy! Over at A Blog Around the Clock, Bora has unveiled the first anthology of Science Blogging. It includes 50 articles, including one on ticks from us. 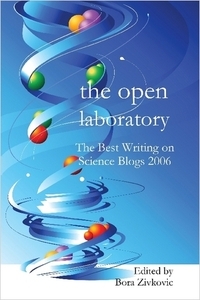 It's called The Open Laboratory, and it's on sale at Lulu.com (in both pdf and print forms) here. We're having a crazy week, so I'm just posting a picture of a parasitic copepod for you to admire -- this is a female Ommatokoita elongata, attached to the eye of a Pacific sleeper shark. The arrows point to the parts of the cornea that have gotten thicker because of the infection. Benz, G. W., Z. Lucas and L. F. Lowry 1998. 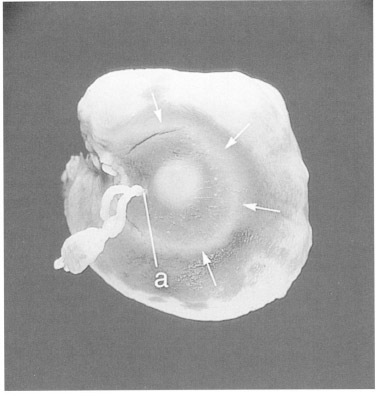 New host and ocean records for the copepod Ommatokoita elongata (Siphonostomatoida: Lernaeopodidae), a parasite of the eyes of sleeper sharks. J. Parasitol. 84 (6): 1271-1274.